Shayne Vincent Greenman is a multiple award-winning Australian master of patisserie based in the Gold Coast Hinterand on Tamborine Mountain, Queensland, Australia. Shayne is a passionate, gifted and a sharing culinary artist who lectures to over 500 local and international students yearly. Shayne has won dozens of regional, national and international awards in an outstanding 41 year career, with his interest beginning at the tender age of 7 years due to the necessity to learn to cook. As the youngest of five boys and the son of a very accepting overworked widowed mother living and growing up in an isolated country town, it wasn’t long before his cooking pursuits became more artistic. His first competition piece was a two-tiered wedding cake with swans floating on a pond with water lilies and very finely piped extension work and lace which won first place and overall best decorated cake and a grand prize of $5 AUS dollars which he still keeps as a good luck memento. No one knew a seven-year-old boy was the decorator. The win caused a stir in the country sugar craft group at the time; however it was the first step, which inspired a fun and sometimes challenging and eclectic career path. For Shayne, 2011 and 2012 was a professional watershed. In early 2011, Shayne became the Australian champion and gold medalist in the Australian Artisan Baking Cup and was then chosen to represent Australia internationally at the 2012 SIGEP Baking Cup in Rimini, Italy where he went on to achieve the HIGHEST SCORE HOLDER since the event’s inception. Shayne holds the title Club Artii Mestieri Champion Artisan baker in artistic bread – Miglior Pezzo Artistico. In late 2012, Greenman won the gold medal placing from the Australian Culinary Federation, Kitchen aid Challenge in the professional open division Modern Wedding Cake and flew to Germany that same day after dropping off of his entry to then represent Australia in the national baking team which placed in the Top 5 at the IBA Baking and Pastry Artisan World Cup in Munich, Germany. In 2010, Shayne won two gold medals at the Aquinas Australian Culinary Championships: one for a Showpiece and the other for a 90 minute open division live Modern Dessert Challenge and in 2009 he participated at one of Australia’s premiere professional culinary event, the Callebaut Australian Chocolate Masters decorated Easter Egg challenge. Another career highlight came in 1994 when he was a member of the winning Australian ‘Gold Medalist’ Team at Bake Skill Asia Pacific in Singapore. His work has been regularly awarded and recognized by the Melbourne Royal Agricultural Society, National Australian Bake Skill Competition and the Australian Culinary Federation. As well as baking, patisserie, chocolate and confectionery, Shayne specializes in bespoke one-of-a-kind large three-dimensional cake sculptures; traditional and modern sugar art and cake decorating. Shayne has been around long enough to see many trends in our craft return in many incarnations and he is always one to acknowledge our Australian early pioneers in our sugarcraft technique who have given us a wealth of information to draw on and share. Shayne has recently been featured as a guest chef on Australian TV Channel 31 and online on chefmasterclasses.com and in a cover story in The Weekend Australian in September 2012. Many will remember him from regular interviews on ABC Radio National discussing baking and food related events. In March 2014, Shayne competed in the Australian Cake and Bake show held at Sydney Olympic Park competing in the invitational masters professional division with three entry display pieces. Shayne has many other pursuits and hobbies when not sugar-crafting. 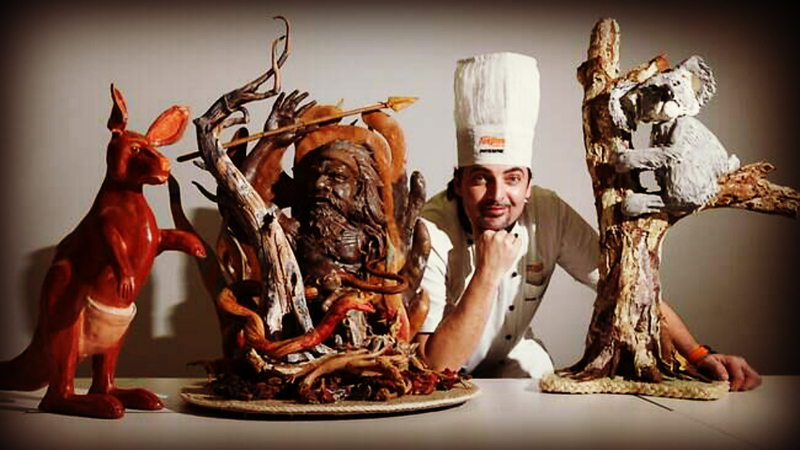 He is always looking for inspiration to capture and showcase in his edible works of art. His garden takes up a lot of spare time with an extensive collection of exotic flowering plants, many orchids lilies and tropical foliage plants to capture, and replicate in sugar. Shayne also has a background as a television and film actor. Click here for his IMDB profile.